The airline operates its largest hub at Seattle–Tacoma International Airport (known as Sea-Tac). It also operates secondary hubs in Los Angeles, Portland and Anchorage, and focus cities at San Diego and San Jose. Although most of its revenue and traffic comes from locations outside of Alaska, the airline plays a major role in air transportation in the state. It operates many flights linking small towns to major transportation hubs and carries more passengers between Alaska and the contiguous United States than any other airline. Alaska Airlines is not a member of any of the three major airline alliances. However, it has codeshare agreements with some members of oneworld, such as American Airlines, British Airways, and LATAM Chile, and with some SkyTeam members, including Air France, KLM, Korean Air and Delta Air Lines. Delta, despite cooperating through codeshares, is a major competitor to Alaska Air in its Sea-Tac market. The Alaska Air Group has been a part of the Dow Jones Transportation Average since 2011, when it replaced the then-parent company of American Airlines, AMR Corporation, in the index. A Stinson "S" Junior aircraft of McGee Airways. McGee Airways was the precursor to present-day Alaska Airlines. The airline traces its roots to McGee Airways, which was started by Linious "Mac" McGee in 1932. The airline flew its inaugural service between Anchorage and Bristol Bay with a Stinson single-engined, three-passenger aircraft. At the time, there were no scheduled flights; a flight took place when there were passengers or a load of cargo or mail. It was the middle of the Great Depression and the airline was struggling financially. There were too many airlines in Anchorage at the time, and not enough demand to support them. In the next few years the airline performed many mergers and acquisitions that produced changes in the name and saw business expand throughout Alaska. The first of these mergers was in 1934, when McGee sold his namesake airline for US$50,000 to Star Air Service, an airline also located in Anchorage. This allowed McGee to enter the mining industry. With a fleet of fifteen aircraft, Star Air Service was a dominant airline in Alaska. But Star continued to struggle financially because of high maintenance costs for its wooden planes. In 1937, McGee came back to the airline and opened a liquor store, and the airline began flying liquor to remote Alaskan communities. That year, Star Air Service purchased Alaska Interior Airlines and was incorporated as Star Air Lines. Star was again sold later that year to a group of miners. In 1938, federal regulation began when Congress created the Civil Aeronautics Board (CAB). The CAB awarded the airline most of the routes that it wanted in Alaska, but the coveted route between Seattle and Anchorage was awarded to Pan American Airways. In 1941, Star Air Service was purchased by Raymond Marshall, a businessman from New York. In 1942, the airline purchased three other airlines in Alaska, Lavery Air Service, Mirow Air Service, and Pollack Flying Service as well as a hangar at the Anchorage airport. That year, the airline's name was changed to Alaska Star Airlines. 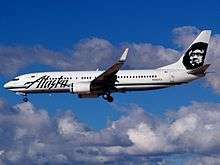 The name Alaska Airlines was adopted on May 2, 1944 having narrowly beaten a competitor who was also applying for the name. In the 1940s Alaska's headquarters were in Anchorage. When the United States entered World War II in December 1941, Alaska Airlines faced a shortage of pilots. During the war, the airline lacked funds and equipment, and pilots were often forced to buy fuel for their planes out of their own pockets. The company, which was frequently subjected to lawsuits, also went through many different presidents during this time. In 1943, Alaska Airlines purchased the Lockheed Model 18 Lodestar, its first multi-engine aircraft. That same year the company's stock was traded for the very first time on the American Stock Exchange. In 1945, Alaska Airlines hired its first stewardesses. In 1947, James Wooten became president of the airline and he began to expand the airline greatly. Under his leadership, the company purchased many surplus military aircraft from the government that were used during World War II. The airline purchased Douglas DC-3s, Douglas DC-4s and Curtiss-Wright C-46 Commandos. Alaska Airlines was the first carrier certified to operate DC-3s on skis. Alaska Airlines' large charter business made it profitable, and the airline moved its base of operations to Paine Field, an airport north of Seattle. It kept a branch office in Anchorage, however. Despite its success, Alaska Airlines' worldwide charter business was short-lived. In 1949, the CAB tightened its regulations and placed heavy fines on the airline and shut it down completely for safety violations. The airline was prohibited from operating worldwide charter flights, and president James Wooten left the company. Also in 1949, Alaska Air began operating five Bell 47B helicopters in order to support oil exploration on the North Slope thus becoming the first airline in Alaska to operate rotary-wing aircraft. In 1949, the airlines lifted many Jews out of Yemen to Israel in what became known as Operation Magic Carpet. C-46 or DC-4 aircraft were used for the nearly 3000 miles flight, From Eritrea to Aden then along the Gulf of Aqaba to Tel-Aviv. The planes then flew to Cyprus in fear of the bombings. More than 40,000 Yemenite Jews were airlifted by Alaska Airlines and other carriers. Alaska Airlines started the 1950s without its worldwide charter business and operations restricted to the state of Alaska. In 1950, it purchased two smaller Alaskan airlines, Collins Air Service and Al Jones Airways. Though the airline had grown much under the ownership of Raymond Marshall, the CAB forced him out in 1951 due to continuing financial troubles. Also, Marshall had owned Alaska Airlines with the intent of getting money for himself and he was not concerned about the long-term stability of the company. In 1951, the CAB awarded Alaska Airlines with a temporary certificate allowing them to operate on routes from the Alaskan cities of Anchorage and Fairbanks to Seattle and Portland in the contiguous United States; this award would become permanent in 1957. In 1952, the CAB appointed Nelson David as president, and he began to improve the financial stability of the airline. By 1957, with the carrier in a better financial situation, David left and Charles Willis, Jr. became the company's new president and CEO. A pilot during WWII, Willis introduced several marketing gimmicks that set the airline apart from other ones of the day. Under his leadership, Alaska Airlines became the first to show inflight movies. The company began service of the Douglas DC-6, the airline's first pressurized plane, enabling flights above clouds and weather disturbances. On these DC-6's, the airline introduced "Golden Nugget" service, which included an on-board saloon and piano. In 1961, competitors began introducing jets on routes Alaska Airlines flew. To counter this competition, Willis negotiated with aircraft manufacturer Convair to purchase a Convair 880 jetliner with no money down for use on routes between Alaska and the contiguous United States. The company introduced the new jet aircraft the same year. In 1966 the company received its first Boeing 727-100 jets and also removed the Convair 880 from the fleet as a financing condition by Boeing concerning the purchase of the 727 jetliners. Several of Alaska's first 727s were series 100C models which could be operated either as all cargo freighters, in an all passenger configuration or as mixed passenger/freight combi aircraft. In the spring of 1967, greatly increased passenger loads required quick addition of fleet aircraft and Alaska purchased a Convair 990 jetliner formerly operated by Brazilian air carrier Varig as PP-JVE which then became Alaska Airlines N987AS. This aircraft remained in service along with an increased fleet of Boeing 727-100's which were then joined by stretched Boeing 727-200s which in turn became Alaska Airlines' signature aircraft for the next 25 years. It also became the first carrier to fly the Lockheed L-100 Hercules (L382 model), the civil version of the military C-130 cargo turboprop, which was used to transport oil drilling rigs to Alaska's North Slope and later to Ecuador. Alaska also owned Lockheed Constellation propliners including two Lockheed L-1649A Starliners from 1962 to 1968, and three L-1049's which were used for Military Air Transport Service operations. Smaller prop and turboprop aircraft were also operated, including the Convair 240, de Havilland Canada DHC-6 Twin Otter and Super Catalina amphibian aircraft as well as two versions of the Grumman Goose amphibian aircraft, one with piston engines and the other model being a conversion to turboprop engines which the airline called the "Turbo-Goose". A Boeing 727–100 at Seattle-Tacoma International Airport. The airline introduced this type in the mid-1960s. During this time, Alaska Air faced some tough competition with other airlines such as Northwest Airlines, Pan Am and Pacific Northern Airlines, the latter being an Alaska-based air carrier operating Boeing 720 jetliners which was subsequently acquired by and merged into Western Airlines in 1967. Northwest and Pan Am at different times operated Boeing 747 wide body jetliners on their services to Alaska with Northwest flying Seattle–Anchorage nonstop with the jumbo jet and Pan Am flying Seattle–Fairbanks nonstop with the 747. To set itself apart from the competition, Alaska Air turned to some cheap but imaginative gimmicks such as having safety instructions read as rhymes, staging fashion shows in the aisles and having bingo games on board while en route. In December 1962 Air Guinée signed a contract with Alaska Airlines which saw the latter company providing management expertise, in addition to two Douglas DC-6s. The deal would have seen Alaska Airlines contracting with the airline over a seven-year period but the contract ended after only six months, leading to the United States Agency for International Development paying a US$700,000 debt owed by the Guinean airline to Alaska Airlines. In 1965, Alaska Airlines turned over some routes between small Alaskan communities, as well as some smaller aircraft, to Wien Air Alaska. This allowed Alaska to focus on more heavily traveled routes and allowed them to sell off smaller aircraft. Throughout the 1960s, Alaska Airlines worked to promote tourism to Alaska by offering charter flights to the continental United States. In an attempt to increase the state's appeal, Alaska Airlines conducted a promotional tour of Japan in 1963. In 1967, as the state of Alaska celebrated its centennial, Alaska Airlines introduced a promotional "Gay Nineties" theme with stewardesses dressed in Edwardian outfits. That year, Alaska Airlines expanded to southeast Alaska with the introduction of service to Sitka. This led to the purchase of two smaller airlines, Alaska Coastal Airlines and Cordova Airlines, in 1968. A Boeing 727-200Adv on approach to Los Angeles International Airport, showing the new livery and logo introduced in the early-1970s. In the beginning of the 1970s, Alaska Airlines began charter service to Siberia in the Soviet Union. This was the result of three years of secret negotiations between Alaska Airlines and Soviet authorities, in which the US Department of State reluctantly chose not to block the plan for fear of a potentially negative response from the Soviets. The airline gained permission to fly more than two-dozen flights in 1970, 1971 and 1972. Alaska Airlines was also operating Boeing 707, Boeing 720 and Boeing 720B jetliners during the early and mid 1970s. However, the airline was not in good financial shape at that time. Like much of the airline industry, Alaska Airlines was hit with rising fuel and operating costs and was on the verge of bankruptcy. Revenues were significantly reduced when work on the Trans-Alaska Pipeline System was delayed. The airline's cargo aircraft had played a key role in building the pipeline, but now sat idle. The airline took another blow on September 4, 1971, when a Boeing 727-100 jetliner crashed on landing in Juneau, killing 111 people and resulting in the worst single-plane crash at the time. Because the airline was struggling financially, the airline's board ousted the president and CEO Charles Willis. Former board member Ronald Cosgrave succeeded him. The airline was US$22 million in debt when Cosgrave took over, so Cosgrave began to make major cuts. The airline's cargo business was dropped completely, as well as many flights and employees. Cosgrave also sought to improve the airline's tarnished image of "Elastic Airlines." The logo was changed to an image of a smiling Eskimo, which remains today. As a result of these efforts, the airline made a profit in 1973 and continued to be profitable thereafter. Alaska Airlines was one of only three US carriers that supported the 1978 Airline Deregulation Act, knowing that they would reap significant growth and other benefits from deregulation. After deregulation, the company's real-estate division was spun off into its own company, with Cosgrave becoming its chairman. Leadership of the airline was passed to Bruce Kennedy, a close associate of Cosgrave. Cosgrave made an alliance with Alaska Airlines to purchase competitor Wien Air Alaska, but this ultimately failed and resulted in fines for Alaska Air and its leaders for improprieties during the attempted acquisition. At the time of deregulation, Alaska Airlines served ten cities in Alaska and one in the contiguous US —the city of Seattle—, and it had only ten planes in its fleet. 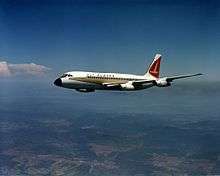 Immediately after deregulation, the airline began to expand, adding the cities of Portland and San Francisco to its network. Soon later, the airline resumed services to the Alaskan cities Nome and Kotzebue, and it also introduced service to Palm Springs, California. Burbank and Ontario were added in 1981. In 1979, Alaska also studied the possibility of acquiring and merging with Hughes Air West, however this never came to fruition. Other cities in the continental US that were added to the airline's route map by 1985 were Oakland and San Jose in California, Spokane in Washington, Boise in Idaho, and Phoenix and Tucson in Arizona. Deregulation also brought challenges to the airline, however. The airline was faced with increased competition and inflation that put tremendous pressure on costs, profits and salaries. By 1979, competitors Northwest Airlines and Western Airlines were both flying wide body McDonnell Douglas DC-10 jets on the core Anchorage–Seattle nonstop route with additional competition being provided by Wien Air Alaska which had begun flying nonstop jet service between Anchorage and Seattle. Northwest was operating nonstop DC-10 service on the Fairbanks–Seattle route at this time as well. There were also tensions with unions, particularly mechanics and flight attendants. In 1985, the company had a three-month-long strike with its machinists. By June the same year, it was able to end the strike by promising to reduce labor costs and maintain peace with unions. In November 1985, the airline introduced a daily air-freight service called Gold Streak with service to and from Alaska. Alaska Airlines was the launch customer for the MD-83 and operated many of these jets throughout the 1980s and 1990s. 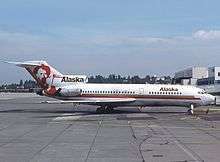 In the 1980s, Alaska Airlines began acquiring McDonnell Douglas MD-80s to replace their aging 727s. Alaska was the launch customer for the MD-83, taking delivery of their first MD-80s in 1985. Also in 1985, the Alaska Air Group was formed as a holding company for Alaska Airlines. 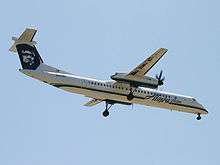 In 1986 Alaska Air Group acquired regional airline Horizon Air, which remained a separate brand from Alaska Airlines; since then, both airlines have been subsidiaries of Alaska Air Group. In 1987, Alaska Airlines purchased Jet America Airlines. Alaska initially operated Jet America as a separate airline, but this proved economically unviable and Jet America's operations were merged into Alaska's. Alaska also discontinued all flights to the Midwest and the East coast formerly operated by Jet America. Additional MD-80s entered the fleet via the acquisition of Jet America Airlines in 1987. There was also a big seasonal imbalance in travel to Alaska, which mainly took place in the summer. In an effort to compensate for this, the airline introduced service to Mexican resorts, where most travel takes place in the winter. In 1988, the airline began servicing the Mexican resort cities of Mazatlan and Puerto Vallarta. By the end of the 1980s, 70 percent of Alaska Airlines' passengers flew south of Seattle and the airline served 30 cities in six states outside Alaska. The airline had successfully used the state of Alaska as a springboard to expand into larger, more profitable markets. An Alaska Airlines Boeing 737-400 landing at Vancouver International Airport. The airline began the 1990s with plans to lease 24 Boeing 737-400s from International Lease Finance Corporation (ILFC), all of which remain in Alaska's fleet to this day. The first aircraft was delivered in April 1992. In 1991, Alaska Airlines added several routes. In the Russian Far East, it added the cities of Magadan and Khabarovsk, as well as service to Toronto, its first Canadian city and the first city east of the Rocky Mountains. However, Toronto was later dropped, in 1992. As the airline marked its 19th consecutive year of profits in a turbulent industry and racked up many awards for customer service, Bruce Kennedy retired in May 1991 and was succeeded by Raymond J. Vecci. Alaska Airlines also faced increased competition from low-cost carriers. One carrier that competed with Alaska was MarkAir. Since it began operating in 1984, competition had been reduced because it had worked out feeder agreements with Alaska Airlines. However, after Alaska Air declined to buy the airline in the fall of 1991, it intensified competition with Alaska. The airline offered low-cost service on the Anchorage-Seattle route and other routes in Alaska, where Alaska Airlines earned almost one-third of its revenues. This hurt Alaska Airlines; for the first time in 20 years, it posted a loss of US$121 million. To save money, the airline canceled two proposed maintenance facilities and deferred a large aircraft purchase worth US$2 billion. It was able to increase utilization on its existing planes, though. The airline also cut labor costs, but this ended up making relations with unions tense. The cost reductions produced quick results. In 1993, their losses decreased to US$45 million and they made a US$40 million profit the next year. Eight percent of these revenues were generated by record-setting cargo operations. Alaska had more competition in 1993 when low-cost airline Southwest Airlines entered the Pacific Northwest by purchasing Morris Air. Nevertheless, Alaska Airlines was able to keep its costs down, but it maintained its high level of customer service. The airline also promoted itself as "the last great airline" and with the motto "For the same price, you just get more", yet analysts felt that Alaska Air needed deeper cost cuts. At the same time, the company had many strikes by the flight attendants' union. Alaska continued to take delivery of new MD-83s during the 1990s, both to meet the demands of a growing route system, and to replace its aging and fuel inefficient 727 fleet. Their last 727 was retired in March 1994. The airline's MD-80 fleet peaked at 44 aircraft in 1996. Vecci was dismissed in 1995 and replaced with John Kelly, former Horizon Air CEO. The airline soon expanded West Coast routes to take advantage of an "open skies" agreement between the US and Canada. Alaska Airlines also pioneered some new technologies through the 1990s. It added a heads-up guidance system in 1989 to operate better in foggy conditions, becoming the first airline to use this technology. In 1995, the airline became the first to sell tickets on the Internet. By 2000, all the airline's planes carried automated external defibrillators, for use in in-flight emergencies. The airline also installed self-service kiosks called "Instant Travel Machines" that printed boarding passes, allowing customers to bypass the traditional ticket counter. An X-ray device, an addition to the unit allowing passengers to check their own baggage was being tested in 1999 at Anchorage. This concept, known as "Airport of the Future" by the airline, was first tested in Anchorage and was later brought to its Seattle hub, and it drew attention from other airlines as well. The airline would also become the first airline in the world to integrate GPS and Enhanced Ground Proximity Warning System (EGPWS) technology, adding a real-time, three-dimensional display of terrain. The system was operational in all the carrier's Boeing 737-400s by April 1999. The late 1990s also saw the carrier recording much profitability. The airline added new training and maintenance facilities. Also, the airline began buying new 737s, ordering three Boeing 737-700s and ten Boeing 737-900s. Alaska Airlines became the launch customer for the 737-900 when it placed an order for it in November 1997. An Alaska Airlines Boeing 737-900 at Seattle-Tacoma International Airport. Alaska was the launch customer of the 737-900 aircraft. With the delivery of Boeing 737 Next Generation aircraft starting in 1999, Alaska began launching more medium-haul flights. In 2000, Alaska started service between Anchorage and Chicago. On May 15, 2001, the airline took delivery of its first 737-900. In 2001, the airline was granted slot exemptions by the Department of Transportation to operate a nonstop flight from Ronald Reagan Washington National Airport to Seattle, but it was halted after only a week due to the September 11, 2001 attacks. The airline resumed service to Reagan Airport on December 4, 2001 to meet the demand. In January 2002, William Ayer was named CEO of Alaska Airlines, who was replaced by Brad Tilden in 2012. Ayer had been serving as president under Kelly since 1997, having come to Alaska from Horizon two years earlier after spending 13 years with the smaller airline. Ayer took over as chairman and CEO of the Alaska in 2003 upon Kelly's retirement. He led the company through a transformation called Alaska 2010 that was intended to insulate the airline from the traditional boom-bust cycle of the airline industry. In 2002, flights to Newark, New Jersey were launched and in 2003, services to Orlando began. In 2003, service to Boston began. In 2003, Alaska Airlines won the Technology Leadership Award from the magazine Air Transport World for its pioneering of new technologies both in the airport and within the airplane itself. The Boeing 737-800 replaced the airline's MD-83s, which were retired in August 2008. In 2005, due to the greater efficiency of the Boeing 737 Next Generation and rising costs for maintenance, fuel, and crew training, Alaska Airlines decided to phase out its remaining 26 MD-80s and trained its pilots to fly the newer Boeing 737-800s that were being ordered to replace them. According to the airline, the MD-80 burned 1,100 US gallons (4,200 l) of fuel per hour, while the 737-800 burns just 850 US gallons (3,200 l) per hour. The last MD-80 flights flew on August 25, 2008, with one flight from San Jose, California to Seattle, Washington and another from Sacramento, California to Seattle, Washington. To mark its transition to an all-Boeing fleet, Alaska Airlines unveiled a 737-800 with Boeing's house colors painted on the fuselage and the airline's Eskimo logo painted on the tail fin. The aircraft, called Spirit of Seattle, shows Alaska's commitment to Boeing and the fact that the airline now has an all-Boeing fleet. Also in 2005, Alaska Airlines contracted out many of its jobs, including ground crew positions, to Menzies Aviation. In some cases this resulted in an almost 40% decline in wages. This agreement was found to be a violation of union agreements in 2008 and the new ground crews caused enough damage to aircraft in the first year to make the savings negligible. In addition, Menzies contractors gained a reputation of stealing from checked bags after a few incidents in 2007. In February 2007, Alaska Airlines introduced its first two Boeing 737-400 Combis to their fleet in order to replace their aging Boeing 737-200 Combi aircraft. The −400 Combis have 20% more passenger and cargo capacity than the aircraft they replaced, and can carry a combination of four cargo pallets and 72 passengers. The aircraft were originally introduced as passenger aircraft in 1992, but have now been converted by Pemco Air Services. Pemco Air Services also converted the airline's Boeing 737-400F. An Alaska Airlines Boeing 737-400 Combi aircraft at Ted Stevens Anchorage International Airport. On September 9, 2007, Alaska Airlines introduced daily nonstop service between Portland, Oregon to Boston, Massachusetts. On October 12, 2007, the airline began service to Hawaii with a flight to Honolulu from Seattle. Seattle–Kauai service began on October 28, 2007 and Anchorage–Honolulu service began on December 6, 2007. On October 26, 2008, Alaska launched service from Seattle to Minneapolis-Saint Paul. On August 3, 2009, service from Seattle to Austin, Texas began. Service from Seattle to Houston began on September 23, 2009 and from Seattle to Atlanta on October 23, 2009. An Alaska – Horizon Bombardier Q400, following the retirement of the Horizon Air brand in 2010. In March 2010, Alaska Airlines began service from San Jose, California to Kahului and Kona, Hawaii, and also from Sacramento, California to Kahului, Hawaii. On September 27, 2010 Alaska Airlines began service between Seattle and Lambert-St. Louis International Airport. On August 23, 2010, Alaska Air Group, the parent company, unveiled a capacity purchase agreement in which all decisions regarding route choices and marketing services for Horizon Air were to be made by Alaska Airlines by early 2011. Therefore, all ticket revenue from Horizon would go directly to Alaska, while Horizon's operating costs would be covered. Subsequently, Alaska retired the Horizon brand. All Horizon aircraft were repainted in the Alaska livery, with Horizon's pre-existing services remaining intact. In January 2011, Alaska Airlines placed an order for thirteen 737-900ERs. The aircraft have been delivered between 2012 and 2014 Alaska also ordered two 737-800s as part of this order. The airline also recorded record profits for 2010, as well as record profits for the fourth quarter of 2010. The profit for the entire year was $251.1 million, an increase from $121.6 million a year earlier. Alaska’s 2010 fourth-quarter profit of $64.8 million was up from $24.1 million from the fourth quarter of the previous year. Also in 2010, Alaska ranked as the most efficient airline operating in The United States. Alaska Airlines continues pioneering new technologies today. In 2011 Alaska Airlines partnered with Boeing and Fujitsu to be the first to use a new technology called Component Management Optimization, which will streamline maintenance checks. It will do this by allowing mechanics to point a handheld device at little RFID tags attached to certain parts of the aircraft, which will display information about when parts were last replaced. This will allow mechanics to perform inspections quicker than conventional methods. The program is scheduled to launch in 2012. Also in mid-2011, the airline issued iPads to its pilots to replace 25 pounds of paper flight manuals that pilots are currently required to carry on flights. Alaska Airlines is the first major airline to use iPads on flights; all pilots had iPads by the middle of June 2011. This was the first part of the airline's initiative to do away with the flight bag; the airline is also considering using iPads for displaying aeronautical charts. In November 2011 Alaska Airlines flew 75 commercial passenger flights in the U.S. powered by biofuel using a 20 percent blend of sustainable biofuel made from used cooking oil that meets rigorous international safety and sustainability standards. On February 16, 2012, Alaska Airlines' CEO, Bill Ayer, retired. Ayer became the airline's CEO in 2002 and has been credited for reducing costs and keeping the airline profitable without going through bankruptcy. The airline's president Brad Tilden officially became the new CEO on May 15, 2012. On March 9, 2012, Alaska Airlines began service from Seattle to Kansas City and on June 11, 2012 began service to Philadelphia. Seattle-Miami flights ended on July 15, 2012, but service to nearby Fort Lauderdale began on July 16. New service to San Antonio began on September 17, 2012. Alaska Airlines also began service from San Diego to Orlando on October 11, 2012. In October 2012 (2012-10), Alaska placed the largest order in its history when it ordered a total of 50 Boeing 737s in a deal worth US$5 billion at list prices. The order consists of 20 Boeing 737 MAX 8s, 17 Boeing 737 MAX 9s and 13 Boeing 737-900ERs. Alaska Airlines announced a plan in June 2013 to begin replacing Boeing 737s on flights between Fairbanks and Anchorage, Alaska with Bombardier Q400s operated by Horizon Air and based out of Anchorage beginning in March 2014. The plan was intended to reduce operating expenses and eventually lower fares, but was met with a great deal of skepticism by Fairbanks residents who expressed their frustration about safety of the aircraft and outside boarding in the cold winter climate through social media. Alaska Airlines responded to the comments on Facebook attempting to reassure passengers of the safety of the Bombardier Q400s as well as promising to address the unusual aspects of flying in Alaska. The airline ended up modifying one of the jetways at Fairbanks International Airport so that passengers would not have to go outside to board. Alaska Airlines has announced 3 new nonstop destinations from Seattle. These services to Charleston, Nashville and Raleigh-Durham will begin in late 2015 using their 737 aircraft. Alaska is additionally starting service between Los Angeles and Baltimore-Washington, starting September 9, 2015. On January 25, 2016, Alaska Airlines unveiled a new update to its brand, including a new logo and livery, for the first time in 25 years. On April 4, 2016, Alaska Air Group announced it will acquire Virgin America for $57 per share. The acquisition is expected to be completed by January 1, 2017. The total price for the acquisition will be approximately $2.6 billion. Alaska Air Group will continue to honor the Loyalty programs of both groups with no foreseen changes. Virgin America's founder Richard Branson is "sad" and disappointed with the merger. Virgin America shareholders have voted to approve the merger. In November 2016, Alaska Airlines flew the first commercial flight using a biofuel blend made from tree cuttings. As of November 2014, Alaska Airlines has 12,998 employees. Alaska's pilot group consists of approximately 1,550 pilots represented by the Air Line Pilots Association, International and its almost 3,400 flight attendants are represented by the Association of Flight Attendants. Since May 2005 (2005-05), the airline's baggage-handling operations have been outsourced to Menzies Aviation. This was in response to rejection of a contract between IAM (the union which represented the baggage handlers), and Alaska Airlines. It also allowed the airline to save an estimated $13 million a year. The Alaska Airlines Foundation, headquartered on the grounds of Ted Stevens International Airport in Anchorage, gives grants to 501(c)(3) non-profit organizations that are classified as charities in the U.S. states of Alaska and Washington. Alaska Air Cargo has regional operations in parts of the United States and has the most extensive air cargo operations on the west coast of the U.S., larger than that of any other passenger airline. Alaska's cargo operations are focused primarily on the northwestern contiguous states and Alaska, between Anchorage and Seattle. South from Alaska, goods that are carried primarily include fresh Alaskan seafood, while products carried north from Seattle primarily include US Postal Service mail; in addition, the airline also carries goods for remote Alaskan communities and personal packages. Alaska Airlines operations at Seattle-Tacoma International Airport. Alaska's route system spans more than 92 cities in the United States, Canada, Costa Rica and Mexico. Some of the locations served in the carrier's namesake state include Anchorage, Adak, Barrow, Cordova, Fairbanks, Juneau, Ketchikan, Kodiak, Kotzebue, King Salmon, Nome, Prudhoe Bay and Sitka, several of which are inaccessible by road. The airline began scheduled operations to the Russian Far East in 1991 following the breakup of the Soviet Union, but suspended the service in 1998 following the 1998 Russian financial crisis. Alaska has historically been one of the largest carriers on the West Coast of the United States as well as to and within the state of Alaska, with strong presences in Seattle and Portland, and serving all four major airports in the San Francisco Bay Area and all five airports in the Los Angeles metropolitan area. In May 2011, SkyWest Airlines began operating six of Alaska Airlines' West Coast routes. They are operating five CRJ-700s purchased from Horizon Air under a capacity purchase agreement. This means that SkyWest would own and operate the aircraft, while Alaska Airlines would be responsible for marketing and selling tickets for the flights. The CRJ-700s are operating on routes that would not be feasible to operate with Horizon's Bombardier Q400s nor with Alaska's Boeing 737s. Since 2008, Alaska Airlines flights, as well as Horizon Air flights, have been part of Oneworld Global Explorer fares. An Alaska Airlines Boeing 737-800 takes off from Los Angeles International Airport in the previous livery. An Alaska Airlines Boeing 737-900ER on final approach to Newark Liberty International Airport in the new livery. Boeing 737-400 10 — 12 132 144 To be retired by the end of 2017. Replacement: 737-900ER. Boeing 737-400C 5 — — 72 72 Freight capacity of 4 freight pallets. To be retired by the end of 2017. Replacement: 737-700F & 737-900ER. Boeing 737-800 61 — 16 147 163 47 aircraft are ETOPS-configured. Boeing 737-900 12 — 16 165 181 Launch customer. Boeing 737-900ER 53 12 16 165 181 40 aircraft are ETOPS-configured.To be delivered between 2012 and 2017. Replacing 737-400. Boeing 737-400F 1 — None Freight capacity of 9.5 freight pallets. To be retired by the end of 2017. Replacement: 737-700F. Since the retirement of its McDonnell Douglas MD-80s in 2008, Alaska Airlines has been operating a fleet consisting of only Boeing 737s. Alaska Airlines became the launch customer of the Boeing 737-900 in 1997 and currently operates twelve of the aircraft. In January 2011, Alaska Airlines placed an order for 15 737s, worth US$1.3 billion at list prices. The order consists of two 737-800s and thirteen 737-900ERs. The 737-900ERs are a new addition to Alaska Airlines' fleet and will be used on the airline's long-haul routes. Thanks to its increased range, the 737-900ER will be able to fly transcontinental routes with more passengers, such as the Seattle-Orlando route. "Depending on the ultimate configuration, the larger 737-900ER will have between 21 and 27 seats more than our existing B737-800 [sic] aircraft and will be a perfect fit for our longer-haul and high-traffic West Coast markets," Alaska Airlines President Brad Tilden said in his company’s release. The airline put its first 737-900ER into service on November 8, 2012 on a flight from Seattle to San Diego. The airline expects to take delivery of the planes between 2012 and 2017. In October 2012 (2012-10), a new order was placed by the carrier in a deal worth more than US$5 billion, this time for a total 50 Boeing 737s. The largest single order in the airline's history, it consists of 20 Boeing 737 MAX 8s, 17 Boeing 737 MAX 9s and 13 Boeing 737-900ERs. In 2014 the airline ordered a further 10 Boeing 737-900ER aircraft, increasing their outstanding orders for the aircraft to 74. They will be used to replace Boeing 737-400s due for retirement by the end of 2017. Since the 1960s, Alaska has consistently operated Boeing jet aircraft in its fleet although the first jetliner type operated by the airline was the Convair 880. Alaska also operated the Convair 990 jetliner. Besides the current Boeing 737 models flown by Alaska, the airline previously operated the Boeing 707 and Boeing 720 as well as the Boeing 727-100, 727-200 and 737-200. The last 727 was retired in May 1994. In the 1980s, Alaska began acquiring McDonnell Douglas MD-80s. Alaska acquired additional MD-80s via the acquisition of Jet America Airlines in 1987. Alaska was the launch customer for the MD-83, and took delivery of the first airplanes in 1985. Alaska continued to take delivery of new MD-83s during the 1990s, both to meet the demands of a growing route system, and to retire its aging and fuel inefficient 727 fleet. In 2005, due to the greater efficiency of the Boeing 737 Next Generation and rising costs for maintenance, fuel and crew training, Alaska Airlines decided to phase out the remaining 26 MD-80s and trained the pilots to fly the newer 737-800s that were being ordered to replace them. The last MD-80 flights took place on August 25, 2008. Alaska also used eight Boeing 737-200 Combi/QCs to suit the unique needs of flying in the state of Alaska. These aircraft were valued for their ability to be rapidly reconfigured (hence the moniker QC or "Quick Change") to match the specific cargo and passenger loads for any given flight. In the all-freight configuration, the 737-200 Combis carried up to six cargo containers, known as "igloos." The palletized floor allowed for passenger seating to range from 26 to 72 seats. The 737-200s were also gravel-kitted, which allowed them to be used at airports such as Red Dog, which formerly featured a gravel runway. Alaska replaced the 737-200s with six reconfigured 737-400s between 2006 and 2007. Five feature a mixed cargo/passenger "Combi" arrangement, and one is a "freighter" carrying only cargo. Unlike the 737-200 Combi, the 737-400 Combis feature a fixed seating capacity of 72 seats. The last 737-200 Combi (short for combination) was retired in 2007 and is now displayed at the Alaska Aviation Heritage Museum. The airline's livery consists of the word Alaska on the fuselage, with painting of a native Alaskan on the vertical stabilizer. The "Eskimo face," as it is often called, was introduced in the early 1970s. In 1988, Alaska considered replacing the Eskimo face with a new logo resembling a mountain, but later decided to keep the Eskimo face logo after many Alaskans were unhappy with plans to remove it. 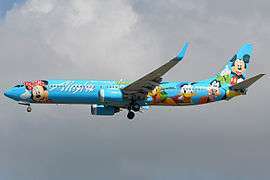 One 737-900 is dubbed the Spirit of Disneyland II, prominently featuring Mickey Mouse and other classic Disney characters. This aircraft replaced the original "Spirit of Disneyland" 737-400 retired at the end of November 2009. Magic of Disneyland, a Boeing 737-400, features Tinkerbell and was painted to promote the Disneyland Resort's 50th Anniversary. Spirit of Make-A-Wish is a cross-promotion with the Make-a-Wish Foundation. It features the Genie from the Disney film Aladdin and was painted to promote the Resort's Year of a Million Dreams promotion. The newest overall and latest Disney aircraft Adventure of Disneyland was introduced on November 7, 2013. The 737-800 aircraft features Mater on the tail, Lightning McQueen, Luigi, and Guido from the Disney-Pixar Cars and Cars 2 films. The aircraft also has the Cars graphic just forward of the L1 and R1 cabin doors. 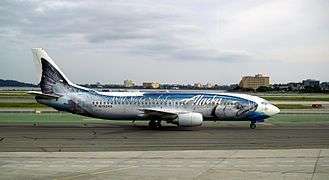 One 737-400 was painted to look like a giant salmon in partnership with the Alaska Seafood Marketing Institute, and was known in aviation circles as the Salmon-Thirty-Salmon. In the fall of 2012, the Salmon-Thirty-Salmon II livery was put on a Boeing 737-800, after the original Salmon-Thirty-Salmon was repainted. One 737-400 has been converted to a full freighter and features Alaska Air Cargo titles. One 737-800 features a "reverse color scheme" livery with alaskaair.com painted on the sides. One 737-800, dubbed Starliner 75, features Alaska's first color scheme, painted to celebrate the carrier's 75th anniversary. The aircraft features the carrier's 75th anniversary logo on the vertical stabilizer, as well as a Boeing logo from the same period on the fuselage below the flight deck windows. One 737-800, dubbed Spirit of Seattle, is a hybrid of two companies' liveries, with the fuselage painted in Boeing's corporate livery, the "Alaska" wordmark near the aft end of the fuselage, and native Alaskan from Alaska's livery on the vertical stabilizer. This aircraft was painted to commemorate Alaska's conversion to an all-Boeing fleet, as well as the Seattle roots of both companies (Boeing was founded in Seattle and still accomplishes final assembly for all its commercial aircraft in the Seattle area). One 737-400 features a musher and sled dog, state ferry, Native Alaskan canoe, bear and whale, along with the statement, "We're all pulling together" to celebrate 50 years of Alaska statehood. The unique design dubbed The Spirit of Alaska Statehood was created by 16-year-old Sitka student Hannah Hamberg. One 737-700 has a professional sports team livery, and is known as the Timbers Jet, which features the colors and logo of the Portland Timbers soccer team. One 737-800, which is ETOPS certified so it can cross the Pacific Ocean, features graphics depicting a voyaging canoe, bright yellow hibiscus, the Hawaiian Island chain, and the phrase "Spirit of the Islands." It was designed by a Hawaiian high school student, Aaron Nee, from Kaiser High School. This livery was the winning design of the second "Paint the Plane" contest that Alaska Airlines has sponsored. One 737-800 was presented to Alaska employees at a company meeting on October 8, 2013. 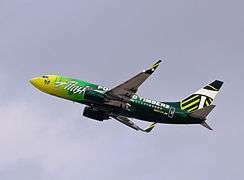 The livery features "Employee Powered" near the tail on each side, two teal to navy blended curved strips, and thousands of signatures between the strips by Alaska Airlines employees that attended company Flight Path meetings. On January 25, 2016 Alaska introduced a new livery to its employees. The words Alaska were changed to a different font style and the plane tail is blue with a more modern eskimo in green and blue. Complimentary meals or light snacks are served to passengers in the first class cabin. In 2006 the airline launched its buy on board meal program, known as Northern Bites, on most flights over 2 ½ hours, including all transcontinental flights. As part of the buy on board program, the airline offers various "Picnic Packs" for a charge in coach/economy class on all flights. On February 1, 2012, Alaska Airlines started serving coffee from fellow Seattle company Starbucks on all of its flights. Previously Starbucks coffee was only offered on Horizon Air flights. Horizon Air had offered Starbucks coffee since February 1, 1990 and was the first airline in the world to serve Starbucks coffee onboard its flights. Alaska also provides local offerings such as Beecher's Cheese, Tim's Cascade potato chips and Alaskan Amber beer. In 2015, Alaska updated inflight hot entrées with options created by Seattle Chef Tom Douglas. Alaska Airlines is recognized by the World Airline Entertainment Association (WAEA) as having an "historic first" in Inflight entertainment by introducing in October 2003 the first portable, hard-drive based, audio-video-on-demand (AVOD) players that deliver a variety of film, TV and audio programs. The device, called the digEplayer was conceived and brought to market by an Alaska Airlines baggage handler named Bill Boyer Jr. digEplayers are available for rent on most long-haul flights for a fee, although they are complimentary to passengers seated in First Class. Alaska Airlines received the "Airline IFE Service of the Year" award at the March 2004 IPEC/LARA Inflight Online Awards Dinner based upon the implementation of the digEplayer, which was awarded "IFE Product of the Year." In 2015 Alaska introduced Alaska Beyond™ with Inflight Entertainment Tablets to replace the digEplayers. It is available on all wi-fi enabled aircraft (most Boeing 737s and Embraer 175 jets) — Alaska Beyond™ allows flyers in First Class and Coach to also use the Gogo® Video Player on their own device in lieu of purchasing the Inflight Entertainment Tablet. Alaska launched trials of In-flight Wi-Fi internet service in 2009. On February 24, 2010 Alaska decided on offering the AirCell Gogo land-based Internet Service for all its planes after it finished testing it on a 737-800. It was initially testing the competing Row44 satellite-based system. In October 2010, Wi-Fi was available on flights between Anchorage and Fairbanks. It has since been expanded to cover all routes served by the airline with the exception of to and from Hawaii. There are only nine aircraft without Wi-Fi, those being three of its 737-400s as well as the 737-400 freighter and combi aircraft. The service is fee-based for all passengers, depending on the length of the flight. Board Room is the Alaska Air Group airport lounge and are located in four west coast airports: Anchorage, Los Angeles, Portland and Seattle. Memberships start at $45 for a single-day pass, up to $875 for a new three-year membership. MVP members receive a 50% discount on the initiation fee and MVP Gold members have their initiation fee waived. Both MVP and MVP Gold are still responsible for the actual annual membership fee. Mileage Plan is the frequent-flyer program of Alaska Airlines and Horizon Air. The program's airline partners also include Oneworld member airlines American Airlines, British Airways, Cathay Pacific, Japan Airlines (from June 29, 2016), LAN and Qantas; SkyTeam member airlines Aeromexico, Air France, Delta Air Lines, KLM and Korean Air; as well as Fiji Airways, Emirates, Era Alaska, Mokulele Airlines, PenAir and Hainan Airlines. The Mileage Plan program has no membership fee, allows one-way redemption and accumulated miles never expire. MVP, MVP Gold and MVP Gold 75K are Mileage Plan's elite tiers for frequent travelers. Higher-tiered members are provided with increased travel benefits such as bonus mileage, priority boarding and complimentary upgrades to first class. MVP is achieved when the member flies 20,000 miles (32,000 km) on Alaska Airlines or Horizon Air, MVP Gold is achieved when the member flies 40,000 miles (64,000 km), and MVP Gold 75K is achieved when the member flies 75,000 miles (121,000 km) on Alaska Airlines or Horizon Air. On November 1, 2011, Alaska Airlines began a new program called Club 49 exclusively for Mileage Plan members who are residents of the state of Alaska. Benefits include free checked bags, and email notifications about fare sales and discounts. The program has no joining fee and memberships are valid for a year after joining before they need to be renewed. Alaska Airlines has had ten major aviation accidents in its history, eight of which resulted in fatalities, with the other two resulting in the aircraft being written off but no fatalities. Flight 009, a Douglas C-54A (NC91009), with routing Anchorage-Yakutat-Port Hardy-Seattle, crash landed while attempting to make an ILS approach at Seattle-Tacoma International Airport in Seattle. The plane went off the runway, rolled down an embankment, struck a ditch, and continued into the intersection of Des Moines Highway and South 188th Street where it struck an automobile, caught fire and spilled fuel all over the area. Of the 28 occupants, there were eight fatalities, plus the driver of the car. The crash was attributed to pilot error. Flight 8, a Douglas C-47A (NC91006), was on routing Homer, Alaska-Kenai, Alaska when the plane struck the side of Ptarmigan Head 9 miles (14 km) east of the center of the airway to Kenai. Of the six passengers on board, there were five fatalities. The cause was determined to be the pilot straying off the designated airway. An Alaska Airlines C-47A (N91008) operating the routing of McGrath, Alaska-Colorado Creek, Alaska crashed into the side of a mountain about 25 miles (40 km) northwest of McGrath. Both pilots perished. Flight 100, a Douglas C-54B (N90449) on the routing of Seattle-Fairbanks-Seattle, hit a mountain 3.8 miles (6.1 km) from Blyn while on approach to Seattle. All five occupants perished. The cause of the crash was the pilot's decision to enter an area of low overcast in mountainous terrain, as well as a navigation error. Flight 779, a Douglas DC-6A (N6118C) operating Seattle-Shemya crashed short of the runway, killing the six crew. The cause of the crash was due to the fact that the air traffic controller in the tower had forgotten to turn on the runway and approach lighting systems during a landing at night. An Alaska Airlines Lockheed L-1049H Super Constellation (N7777C) with 28 passengers and four crew members aboard landed with landing gear retracted during heavy snowfall at Kotzebue Airport. Everyone on board survived but the aircraft was damaged beyond repair. Flight 1866, a Boeing 727-193 operating Anchorage-Cordova-Yakutat-Juneau-Sitka, crashed into a mountain in the Chilkat Mountain Range about 18.5 miles (29.8 km) from the airport while on approach to Juneau. All seven crew members and 104 passengers were killed. The cause of the crash was determined to be misleading navigational information given to the flight crew, the failure of the crew to use all navigational aids and not performing the required audio identification of the navigational facilities. Flight 60, a Boeing 727-81 (N124AS) operating Juneau-Ketchikan, overran the runway while landing in Ketchikan after the captain decided to attempt a go around at the last moment. One passenger died in the accident. The cause of the crash was determined to be pilot error for initiating a go-around after commitment to landing and the pilot's "unprofessional decision" to abandon the precision approach. An Alaska Airlines Boeing 727-90C (N766AS) at Anchorage International Airport with two people on board struck a jetway while taxiing and caught fire, destroying the aircraft. The avionics technician inadvertently deactivated the brake pressurization system. Flight 261, a McDonnell Douglas MD-83, plunged into the Pacific Ocean near Point Mugu, California while preparing to attempt an emergency landing at Los Angeles International Airport en route from Puerto Vallarta, Mexico, to San Francisco and Seattle, killing all 88 people on board. In its final report, the National Transportation Safety Board (NTSB) determined the cause of the accident to be failure of acme nut threads, which were part of the jackscrew assembly for the horizontal stabilizer's trim system. The failure of the acme nut threads happened because of insufficient lubrication of the jackscrew assembly, which was the result of Alaska's extended lubrication and inspection intervals and from the Federal Aviation Administration's (FAA) approval of those intervals. NTSB also found that the lack of a fail-safe mechanism for the failure of the acme nut threads on the MD-80 design contributed to the accident. This incident, along with an earlier ValuJet Flight 592 crash, led to closer FAA oversight of airline maintenance operations. The accident was also the subject of episode 6, season 1, of the documentary series, Mayday. 1 2 Norwood, Tom; Wegg, John (2002). North American Airlines Handbook (3rd ed.). Sandpoint, ID: Airways International. ISBN 0-9653993-8-9. 1 2 3 4 "Cities served - Alaska Airlines". Newsroom - Alaska Airlines. Alaska Airlines. September 2016. Retrieved October 15, 2016. With hubs in Anchorage, Alaska, Los Angeles and Portland, Oregon; Alaska calls Seattle home. The carrier offers more nonstop flights from Seattle than any other carrier. ↑ "Alaska Airlines is in a Newark State of Mind". ↑ Associated Press (February 16, 2012). "Alaska Air CEO retiring; insider to replace him - Yahoo! News". News.yahoo.com. Retrieved May 17, 2012. 1 2 Wilhelm, Steve (July 2, 2015). "Alaska Airlines logs big boost in passengers as it combats rival Delta". Puget Sound Business Journal. Retrieved 2015-07-03. ↑ "J.D. Power Study Ranks Alaska Airlines Highest in Traditional Carrier Satisfaction for Seventh Straight Year". The Wall Street Journal. May 14, 2014. 1 2 "Alaska Airlines Awards & Recognitions". Retrieved June 21, 2011. 1 2 "Company Facts". Alaska Airlines. June 2011. Archived from the original on May 9, 2012. Retrieved May 9, 2012. ↑ Hwang, Inyoung (November 30, 2011). "Alaska Air to Replace AMR in Dow Jones Transportation Average". Bloomberg Businessweek. Archived from the original on May 9, 2012. Retrieved May 9, 2012. 1 2 3 4 5 Crowley, Walt (February 1, 2000). "HistoryLink Essay: Alaska Airlines". Historylink.org. Archived from the original on May 17, 2012. Retrieved May 17, 2012. 1 2 3 4 5 6 7 8 9 "Alaska Airlines History by Decade". Alaska Airlines. Archived from the original on May 17, 2012. Retrieved May 17, 2012. 1 2 3 4 5 6 7 8 9 10 11 Glab, Jim (December 1, 2007). "Alaska Airlines 75th Anniversary". Air Transport World. Archived from the original on May 17, 2012. Retrieved May 17, 2012. 1 2 3 4 5 6 7 8 9 10 11 12 13 14 15 16 17 18 19 20 21 22 23 24 25 26 27 28 29 30 "Alaska Air Group, Inc. – Company History". Funding Universe. Retrieved April 16, 2011. 1 2 Alaska Airlines Gets New Chief. St. Petersburg Times. June 3, 1947. Section 2, Page 11. Retrieved on Google News (12 of 59) on February 18, 2010. ↑ "Operation Magic Carpet". AlaskaAir. ↑ Guttery, Ben R. (1998). Encyclopedia of African airlines. New York City, New York: Ben R. Guttery. pp. 78–79. ISBN 0-7864-0495-7. 1 2 3 4 5 6 "Alaska Airlines Completes Transition to All-Boeing Fleet". Alaska Airlines. August 28, 2008. Archived from the original on June 12, 2012. Retrieved August 18, 2012. ↑ "Historical Overview". Alaska Airlines. Archived from the original on May 17, 2012. Retrieved May 17, 2012. ↑ "Alaska Air Group: 2008 Annual Report". corporate-ir.net. Archived from the original on June 12, 2012. Retrieved June 12, 2012. ↑ Serling, Robert J. (2008). Character and Characters: The Spirit of Alaska Airlines. Seattle: Epicenter Press. p. 238. ISBN 978-1-933245-11-9. 1 2 Serling, Robert J. (2008). Character and Characters: The Spirit of Alaska Airlines. Seattle: Epicenter Press. p. 237. ISBN 978-1-933245-11-9. ↑ "Alaska To Get 1st Delivery of Boeing 737-400 order". Seattle Times. April 17, 1992. Retrieved September 11, 2012. 1 2 "Alaska Airlines Accelerates Aircraft Retirement - Charges to be Taken Against 1993 Results". The Free Library. December 16, 1993. Retrieved May 1, 2012. ↑ "World Airline Directory 1996". Flight International. March 20, 1996. Retrieved May 1, 2012. ↑ Lane, Polly (November 10, 1997). "Boeing Gets $2 Billion In New Orders For Jets". The Seattle Times. Archived from the original on July 4, 2012. Retrieved July 4, 2012. 1 2 "Alaska Airlines Order Launches Boeing 737-900 Program". Boeing. November 10, 1997. Archived from the original on July 4, 2012. Retrieved July 4, 2012. ↑ "Alaska Airlines Receives First Boeing 737-900". Boeing. May 16, 2001. Retrieved February 13, 2012. ↑ "Alaska Airlines Resumes Daily Service To Reagan National, Continues Daily Service To Dulles International". Alaskasworld.com. December 3, 2001. Archived from the original on October 18, 2002. Retrieved August 22, 2011. ↑ "Alaska Airlines Announces New Service To Orlando". Alaskasworld.com. February 26, 2003. Archived from the original on October 30, 2007. Retrieved August 22, 2011. ↑ "Alaska Airlines Inaugurates Seattle–Miami Service". Alaskasworld.com. November 21, 2002. Archived from the original on October 6, 2003. Retrieved August 22, 2011. ↑ "Alaska Airlines launches Seattle–New York service". Alaskasworld.com. October 28, 2002. Archived from the original on December 3, 2008. Retrieved August 22, 2011. ↑ "Alaska Airlines Introduces Boston–Seattle Service With $149 Fares". Alaskasworld.com. March 27, 2002. Archived from the original on February 20, 2003. Retrieved August 22, 2011. 1 2 Wallace, James (June 26, 2008). "Alaska's newest 737 – in Boeing colors". Seattle Post-Intelligencer. Archived from the original on September 1, 2012. Retrieved September 1, 2012. ↑ "Runway End Run". The Stranger. Seattle, United States. May 29, 2013. Retrieved May 30, 2013. ↑ Arbitrator rules Alaska Airlines broke union contract when it outsourced baggage handling. The Seattle Times. August 8, 2008. Retrieved September 27, 2013. ↑ 2 tarmac workers fired over bumping of jets at Sea-Tac. The Seattle Times. November 2, 2010. Retrieved September 27, 2013. ↑ 2 airport workers arrested in thefts from fliers' bags. The Seattle Times. February 14, 2007. Retrieved September 27, 2013. 1 2 "Alaska Airlines Introduces Two 737-400 "Combi" Aircraft to Fleet". Alaska Air Group. February 1, 2007. Retrieved October 25, 2011. ↑ "Alaska Airlines Launches Daily Nonstop Portland-Orlando, Portland-Boston Service". Alaska Air Group. September 7, 2007. Retrieved October 25, 2011. ↑ "Alaska Airlines Inaugurates Service to Hawaii". Alaska Airlines. October 12, 2007. Retrieved July 12, 2012. ↑ "Alaska Airlines Links Seattle-Minneapolis St. Paul". Alaska Airlines. October 26, 2008. Retrieved July 12, 2012. ↑ "Alaska Airlines Expands Texas Service With Seattle-Austin Flights Starting Today". Alaska Airlines. August 3, 2009. Retrieved July 12, 2012. ↑ "Alaska Airlines Launches Daily Service Between Houston and Seattle". Alaska Airlines. September 23, 2009. Retrieved July 12, 2012. ↑ "Alaska Airlines Launches Daily Service Between Seattle-Atlanta". Alaska Airlines. Retrieved July 12, 2012. ↑ "Alaska Airlines Announces New Hawaii Flights From Sacramento and San Jose". Alaska Air Group Investor Information – News Release. Phx.corporate-ir.net. Retrieved August 22, 2011. ↑ Mutzabaugh, Ben (June 17, 2010). 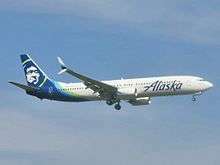 "Alaska Air To Add Saint Louis Service". USA Today. Archived from the original on August 2, 2012. Retrieved August 2, 2012. ↑ "Alaska Airlines Begins Seattle-St. Louis Service". Alaska Airlines. September 27, 2010. Retrieved August 3, 2012. ↑ "Horizon Air Changes Business Model". Aviation Week. August 23, 2010. Retrieved August 26, 2010. ↑ Mutzabaugh, Ben (January 26, 2011). "Horizon Air to 'retire its public brand' in favor of Alaska Air". USA Today. Retrieved December 13, 2011. 1 2 3 "Boeing, Alaska Airlines Complete Contract for 15 Next-Generation 737s" (Press release). Boeing. January 25, 2011. Archived from the original on August 2, 2012. Retrieved August 2, 2012. 1 2 3 4 Cohen, Aubrey (January 25, 2011). "Alaska Air reports record profit, orders Boeing 737s". Seattlepi.com. Archived from the original on August 2, 2012. Retrieved August 2, 2012. 1 2 "Boeing lands $1.3 billion Alaska Airlines order | KING5.com | Seattle Business and Technology News". KING5.com. January 25, 2011. Archived from the original on August 2, 2012. Retrieved August 2, 2012. ↑ International Council on Clean Transportation. "U.S. domestic airline fuel efficiency ranking, 2010". theicct.org. Retrieved April 3, 2015. ↑ "Using radio frequency to inspect airplanes (Video)". Boeing. May 17, 2011. Retrieved May 19, 2011. ↑ "Alaska Airlines Pilots Go Lean and Green with iPads". Alaska Air Group. May 27, 2011. Retrieved May 28, 2011. ↑ "Alaska Airlines to Operate 75 Flights from Seattle Using Biofuel". November 7, 2011. Retrieved August 2, 2012. ↑ Gates, Dominic (February 16, 2012). "Brad Tilden new Alaska Air CEO as Bill Ayer announces retirement". The Seattle Times. Retrieved March 4, 2012. ↑ "Alaska Airlines Inaugurates Nonstop Service Between Seattle and Kansas City, Mo.". Alaska Airlines. March 9, 2012. Retrieved August 3, 2012. ↑ "Alaska Airlines Inaugurates Daily Flights Between Seattle and Philadelphia" (Press release). Alaska Airlines. June 11, 2012. Retrieved August 3, 2012. ↑ "Alaska Airlines Launches Daily Service Between Seattle and Fort Lauderdale, Fla.". Alaska Airlines. July 17, 2012. Retrieved August 3, 2012. ↑ "Alaska Airlines Inaugurates Daily Service Between Seattle and San Antonio, Texas". Alaska Airlines. September 17, 2012. Retrieved October 17, 2012. ↑ Mutzabaugh, Ben (June 1, 2012). "Alaska Air adds Orlando to growing San Diego route map". USA Today. Archived from the original on August 2, 2012. Retrieved August 2, 2012. ↑ "Alaska Airlines Begins Nonstop Service Between San Diego and Orlando, Fla." (Press release). Alaska Airlines. October 12, 2012. Retrieved October 17, 2012. 1 2 3 4 Blachly, Linda (October 11, 2012). "Alaska Airlines places $5 billion 737, MAX order". Air Transport World. Archived from the original on October 11, 2012. Retrieved October 11, 2012. 1 2 Perry, Dominic (October 11, 2012). "Alaska orders 50 Boeing 737s in $5 billion deal". London: Flightglobal. Archived from the original on October 11, 2012. Retrieved October 12, 2012. 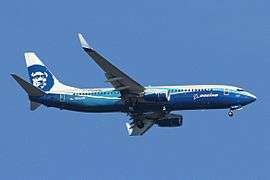 1 2 "Boeing, Alaska Airlines Announce Order for 737 MAXs and Next Generation 737s". Boeing. October 11, 2012. Archived from the original on October 11, 2012. Retrieved October 11, 2012. ↑ Buxton, Matt (June 7, 2013). "Alaska Airlines responds to complaints about switch to turboprops". Fairbanks Daily News-Miner. Retrieved October 4, 2013. ↑ "Flights from Los Angeles to Baltimore- Alaska Airlines". ↑ "Alaska Airlines Unveils First Major Brand Change in 25 Years" (Press release). Alaska Airlines. January 25, 2016. Retrieved January 25, 2016. ↑ Baskas, Harriet (January 25, 2016). "Alaska Airlines' iconic Eskimo gets a makeover". USA Today. Retrieved January 25, 2016. ↑ Gates, Dominic (January 25, 2016). "Alaska Air adds splash of color to its familiar look". The Seattle Times. Retrieved January 25, 2016. ↑ "Alaska Air to acquire Virgin America in $4bn deal". BBC News. April 4, 2016. Retrieved April 4, 2016. ↑ News, A. B. C. (April 4, 2016). "Virgin America, Alaska Air Merger: What Customers Should Know". ↑ "Biofuel: Wood scraps help power Alaska Air cross-country flight". USA TODAY. Retrieved 2016-11-15. ↑ "Employees and Collective Bargaining". Alaska Airlines. Archived from the original on July 28, 2012. Retrieved July 28, 2012. ↑ Allison, Melissa (May 14, 2005). "Alaska Airlines outsources 472 baggage-handling jobs". The Seattle Times. Archived from the original on July 28, 2012. Retrieved July 28, 2012. ↑ "Alaska Airlines Foundation". Alaska Airlines. Archived from the original on July 28, 2012. Retrieved July 28, 2012. ↑ "Alaska Air Cargo". Alaska Airlines. June 2011. Archived from the original on July 28, 2012. Retrieved July 28, 2012. ↑ "Seattle's hometown airline named official airline of Mariners". Seattle Mariners. April 2010. Retrieved April 5, 2010. ↑ "Portland Timbers announce extension of jersey sponsorship partnership with Alaska Airlines". Major League Soccer. October 2013. Retrieved October 13, 2013. ↑ Russia Far East Destinations. Alaska Airlines. Archived from the original on December 5, 1998. Retrieved on August 5, 2012. ↑ Brooke, James (March 30, 1997). "Alaska Airlines Opens Russia's 'Wild East'". New York Times. Retrieved August 11, 2012. ↑ "Alaska Air halts flights to Russia's Far East". Associated Press. Highbeam Research. October 8, 1998. Retrieved August 17, 2012. ↑ "Cities Served". Alaska Airlines. Retrieved August 6, 2012. 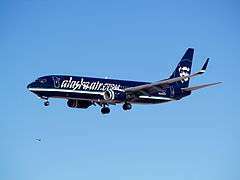 ↑ "Alaska Airlines signs flying deal with SkyWest". USA Today. February 25, 2011. Retrieved August 22, 2011. ↑ "Profile on Alaska Airlines". CAPA. Centre for Aviation. Archived from the original on 2016-10-29. Retrieved 2016-10-29. 1 2 "Alaska Airlines and Aeromexico Partner to Make Travel Easier to the United States". AlaskaAir.com. December 20, 2012. Retrieved May 15, 2013. ↑ "British Airways / Alaska Airlines begins codeshare service from late-Nov 2016". www.routesonline.com. Retrieved November 21, 2016. ↑ "Alaska and Horizon join oneworld's Global Explorer round-the-world fare" (Press release). Oneworld. October 28, 2008. Retrieved August 6, 2012. ↑ Oneworld. "oneworld – Global Explorer". Retrieved July 30, 2009. 1 2 "Alaska Airlines Fleet Facts". Alaska Airlines. March 2014. Retrieved December 11, 2013. 1 2 "Alaska Airlines Upgrading its Aircraft With New Seats and Power Outlets". AlaskaAir.com (Press release). Alaska Airlines. April 23, 2013. Retrieved May 15, 2013. 1 2 Alaska Airlines Adds New Boeing 737-900ER to its Fleet. Alaska Airlines. November 8, 2012. Retrieved November 22, 2012. ↑ "Alaska Airlines". Alaska Airlines. Retrieved 2016-10-08. ↑ "More 737s for Alaska". Airliner World: 14. December 2014. ↑ "The Airplane That Never Sleeps". Boeing. July 15, 2002. Archived from the original on August 18, 2012. Retrieved August 18, 2012. ↑ Flightline Alaska Aviation Heritage Museum. Archived from the original on February 3, 2010. Retrieved August 18, 2012. ↑ "Alaska Airlines Featured in Newest Exhibit at Alaska Aviation Heritage Museum". Alaska Airlines. June 12, 2007. Archived from the original on May 14, 2008. Retrieved September 11, 2012. ↑ "World Airline Directory 1960". Flight International. April 8, 1960. Retrieved December 19, 2011. ↑ "World Airline Directory 1970". Flight International. March 26, 1970. Retrieved December 19, 2011. ↑ "World Airline Directory 1980". Flight International. July 26, 1980. Retrieved December 19, 2011. ↑ "World Airline Directory 1990". Flight International. March 14, 1990. Retrieved December 19, 2011. ↑ "World Airline Directory 2000". Flight International. March 21, 2000. Retrieved December 19, 2011. ↑ Gapay, Les (January 12, 1988). "Many frown over possible removal of Alaska Airlines' smiling Eskimo face". Seattle Post-Intelligencer: p. B5. 1 2 3 4 5 6 7 8 "Aircraft Livery". Alaskaair.com. Retrieved September 12, 2012. ↑ Mutzabugh, Ben (November 7, 2013). 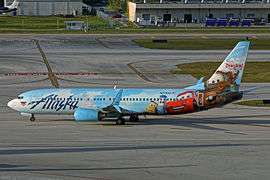 "Alaska Airlines launches fifth Disney-themed jet". Seattle Post-Intelligencer. ↑ Schaul, Jordan (May 15, 2012). "The World's Largest King Salmon at 30,000 Feet". News Watch. National Geographic. Archived from the original on September 1, 2012. Retrieved September 1, 2012. ↑ Demer, Lisa (January 3, 2009). "Sitka teen wins 'Paint the Plane' contest: Alaska News". Anchorage Daily News. Archived from the original on September 1, 2012. Retrieved September 1, 2012. ↑ "Timbers Jet Theme Plane". Aircraft Information. Alaska Airlines. Retrieved September 13, 2012. ↑ Mutzabugh, Ben (June 5, 2013). "Alaska Air unveils 'Spirit of the Islands' Boeing 737". USA Today. ↑ "Alaska Airlines to thank its employees with a special "Employee powered" logojet | World Airline News". Retrieved 10 August 2014. ↑ "First Class Food and Beverage Service." Alaska Airlines. Retrieved September 16, 2012. ↑ "Alaska Airlines Expands Northern Bites Meals-For-Purchase Program" (Press release). Alaska Airlines. July 14, 2006. Retrieved September 17, 2012. ↑ "Fresh Meals". Main Cabin Food and Beverage Service. Alaska Airlines. Retrieved September 17, 2012. ↑ "Picnic Packs". Main Cabin Food and Beverage Service. Alaska Airlines. Retrieved September 17, 2012. ↑ "Alaska Airlines and Starbucks Team Up to Serve Freshly Brewed Coffee Onboard". Alaska Airlines. February 1, 2012. Archived from the original on September 16, 2012. Retrieved September 16, 2012. ↑ Group, Sinclair Broadcast. "Alaska Air, Tom Douglas and other big names launch Alaska Beyond". ↑ "Introducing Alaska Beyond - Alaska Airlines". ↑ WAEA Inflight Entertainment Historical Firsts. World Airline Entertainment Association. Archived from the original on August 29, 2008. ↑ "Alaska To Become First Carrier To Offer APS DigEPlayer Portable Video On Demand Entertainment System". Alaskasworld.com. September 9, 2003. Archived from the original on September 16, 2012. Retrieved September 16, 2012. ↑ Cook, John (September 9, 2003). "Sky's the limit for a baggage handler's in-flight entertainment system". Seattlepi.com. Archived from the original on September 16, 2012. Retrieved September 16, 2012. ↑ "Movies, Music, and More from digEplayer". Alaskaair.com. Retrieved August 22, 2011. ↑ "Alaska Beyond Inflight Entertainment - Alaska Airlines". ↑ Malik, Om (February 27, 2009). "Alaska Airlines to Offer In-flight Internet Access". gigaom.com. Archived from the original on September 16, 2012. Retrieved September 16, 2012. ↑ "Alaska Airlines Trials Satellite-Based Inflight Wireless Internet Service". Alaska Airlines. February 26, 2009. Archived from the original on September 16, 2012. Retrieved September 16, 2012. ↑ "Alaska Airlines to Offer Gogo Inflight Internet". Gogoinflight.com. February 24, 2010. Retrieved September 17, 2010. ↑ "Travel – Alaska Airlines offers Internet service in Alaska". The Seattle Times. October 22, 2010. Archived from the original on October 25, 2010. Retrieved October 22, 2010. ↑ "Alaska Airlines In-flight Wi-Fi". Alaskaair.com. Retrieved August 22, 2011. ↑ "Alaska Airlines In-flight Wi-Fi Available On Most Every Aircraft". Alaska Airlines. June 2, 2011. Archived from the original on September 16, 2012. Retrieved September 16, 2012. 1 2 3 "MVP & MVP Gold Qualification Levels and Benefits". Alaska Air Group. Retrieved September 14, 2009. ↑ "Board Room Membership Fees". Alaska Air Group. Retrieved September 14, 2009. ↑ "Alaska Air makes Japan Airlines its 17th frequent-flier partner". ↑ "Mileage Plan Airline Partners". Alaska Air Group. Retrieved September 14, 2009. ↑ "Other Mileage Plan Information". Alaska Air Group. Retrieved September 14, 2009. ↑ "Mileage Plan Program Benefits". Alaska Air Group. Retrieved September 14, 2009. ↑ "Alaska Airlines Mileage Plan – Announcing MVP Gold 75K Elite Benefits". Alaskaair.com. Retrieved August 22, 2011. ↑ "Alaska Airlines Debuts New Club 49 Benefits Program Exclusively for Alaska State Residents". Alaska Airlines. October 18, 2011. Retrieved December 17, 2011. ↑ "Introducing Club 49". Alaska Airlines. Retrieved September 18, 2012. ↑ "Club 49 Q & A". Alaska Airlines. Retrieved August 16, 2012. ↑ "Technical report" (PDF). December 22, 1976. Archived (PDF) from the original on September 29, 2012. Retrieved September 29, 2012. ↑ "Alaska Airlines Flight 261 – National Transportation Safety Board (NTSB)". Archived from the original on June 4, 2011. Retrieved June 13, 2012. ↑ "Mayday premieres on Discovery, Wednesday, September 3 at 10 pm". Cineflix Productions. August 14, 2003. Retrieved December 10, 2011.